Noah's and Other's Ancient Arks. I think this got wiped out in some computer problem. It was a great Topic. Will try to reconstruct it. I had posted lots of info from a site called Sacred Texts. There is evidence in ancient Chaldean tablets of a Great Flood in a time period earlier than the flood mentioned in the ancient Torah...Old Testament. "Cory's Fragments" refer back to an even more ancient time. 6. . . . . . I come up after thee. 7. say how thou hast done it, and in the circle of the gods life thou hast gained." 10. and the wisdom of the gods I will relate to thee. 18. their will revealed in the midst of . . . . .
21. make a great ship for thee . . . . . . .
22. I will destroy the sinners and life . . . . .
26. . . . cubits the amount of its breadth and its height. 27. Into the deep launch it." 30. I will perform, it shall be done. 35. . . . . . . . . . . . .fixed . . . . . . . . . . Here there are about fifteen lines entirely lost. The absent passage probably described part of the building of the ark. 51. it . . . . . . . .
52. which in . . . . . . . .
75. reeds I spread above and below. 76. . . . . . . went in two thirds of it. 81. the beasts of the field, the animals of the field, and the sons of the army all of them, I caused to go up. 91. the palace I gave to his hand. 104. it destroyed all life, from the face of the earth . . . . .
105. the strong tempest over the people, reached to heaven. 108. Sought refuge; they ascended to the heaven of Anu. 109. The gods, like dogs with tails hidden, couched down. 120. covered were their lips for the coming evil. 125. quieted. The sea he caused to dry, and the wind and tempest ended. 128. like reeds their corpses floated. 131. over my refuge came peace. 132. I was carried over the shore, at the boundary of the sea. 133. For twelve measures it ascended over the land. 135. the mountain of Nizir stopped the ship, and to pass over it, it was not able. 136. The first day and the second day, the mountain of Nizir the same. 137. The third day and the fourth day, the mountain of Nizir the same. 138. The fifth and sixth, the mountain of Nizir the same. 141. a resting place it did not find, and it returned. 143. a resting place it did not find, and it returned. 144. I sent forth a raven, and it left. 146. it did eat, it swam, and wandered away, and did not return. 150. at the bottom of them, I placed reeds, pines, and simgar. 151. The gods collected at its burning, the gods collected at its good burning. 156. in those days I prayed that for ever I might not endure. 163. let not any one come out alive, let not a man be saved from the deep. A historic article in which the discovery of the Babylonian Deluge account was announced, an episode from the Gilgamesh myth. An academic has renewed his search for Noah’s Ark on Mount Ararat in Turkey, where it has long been thought to lie. Professor Paul Esprante, from California, is carrying out in-depth research in the hope of locating the biblical boat, which has been the subject of searches for centuries. After arriving in Turkey, he told the Anadolu Agency: “My purpose is to visit the sites around the mountain to find clues about catastrophic events in the past. However, he added: “At this point it is too early to know what we are going to find. Professor Esprante was speaking after attending a three-day meeting of more than 100 academics who are trying to locate the site of the ark. The story of Noah’s Ark is mentioned in Judaism, Christianity and Islam. It tells of how God warned Noah about a flood that would imminently cover the entire earth, and instructed him to build a boat to keep alive him and his family, as well as a pair of each animal species. Historical evidence suggests there was indeed a flood at the time that the story of Noah is said to have taken place. The ark, meanwhile, is thought to have landed on Mount Ararat in Turkey’s eastern Agri province. 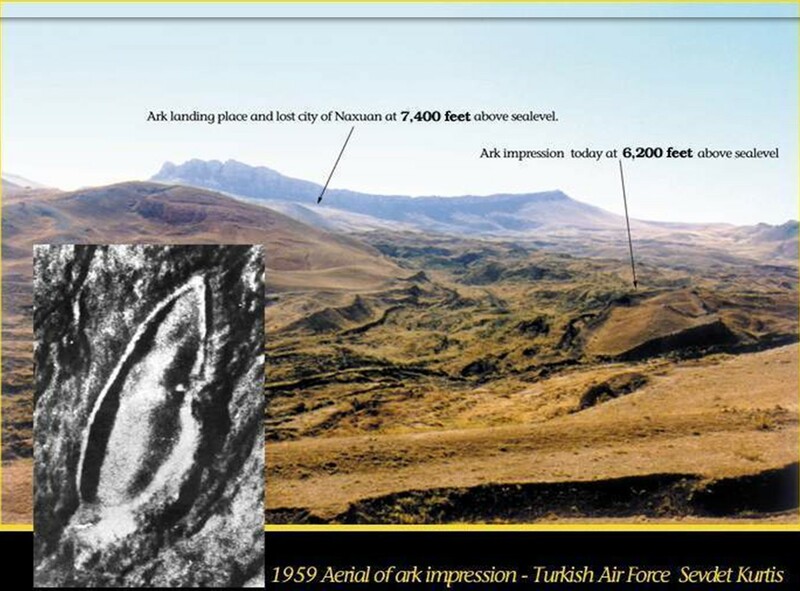 In addition to biblical references to the vessel landing on the "mountains of Ararat", modern aerial images have revealed an object that appeared to resemble part of a ship. Apparently from Bible genealogy tables, Noah's son Ham had married a woman from the lineage of Cain, bringing her along with her DNA onto the ark and into the post-flood world. She then abandoned him after the flood, and went on to spawn offspring with other mates elsewhere. That was a whole new twist on the story for me, as I had always assumed that the generation after Noah was fairly untainted.